The affiliate program on the Japanese Amazon.co.jp, is known to be the most difficult associates program to get approved to. The language barrier being the least of your problems. Or it could be very easy, you just never know until you try. While there is not one miracle method that you can follow to get accepted, there are many factors that can be taken into consideration. And since very little information seems to exist in English, I decided to write down my research from Japanese blogs & forums, with my own experience included. What you do with the information is up to you. It can be used to trouble shoot a disapproved application, or take precautions on the registration process for example. 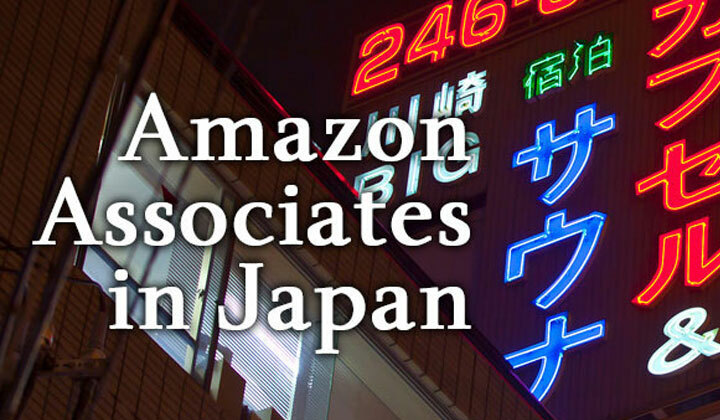 Although the actual Amazon Associates application process is in Japanese, it accepts any nationality to register with an overseas phone number and address. You can also first register the basic Amazon Japan account in English which is highly recommended to make the application process easier. Just see this guide on Amazon.co.jp in English for the appropriate links to get started. Please note, that it is advised to use 100.1% same contact details in your normal account and the associates application. When deciding which website to use for the initial registration, the langue factor can be taken into account. In theory an English or any other language website or blog can be approved, although a Japanese website could potentially increase your chances. Another method that has been often used by the Japanese is to open up a simple, separate blog with the implied intent of looking “amateurish”. After first getting approved to the program, one can use the affiliate links on their actual site. The most commonly used platform for this purpose is the Ameba’s Ameblo (アメブロ) blogging and social networking service. It’s totally free & one of the most popular such sites in Japan. A cheap, easy way to create a Japanese blog is to use the Fiverr marketplace where you can translate content as well as your blog description for the application form, into Japanese for just $5 per text. Or have someone create the content for you. For the actual Amazon Associates application process, in my experience it’s better to use Google Chrome which has the most reliable automatic translation feature. It can take several attempts to get approved until usually some specific detail of the application is changed that leads to your approval. So it can be OK to persist with caution in mind. The fault can be in connection with your normal Amazon account. The contact details, including phone number not being the same as in the application for example. Unlike Amazon Associates programs from other countries, phone number verification is used. This verification can be done only once per account! Established, amateur websites seem to have no problem getting passed approval. When on the contrary a professional, over-confident approach has been claimed to affect the decision. Soon after registration and while waiting approval decision, some set the payment method to gift card to give a favourable situation for Amazon. Then change it later. The best answer for the reason for joining with the program is claimed to be the choice that contains both monetising and bringing valuable content. If it is an account related problem, the application can be done with another name and account. Even if the website stays the same. Also, the name for making payments can be freely changed at a later time. Or in the case of gift cards, they can be applied to any account. If the application is denied, Amazon sends this disapproval mail with supposed help on diagnosing the problem. Unfortunately the information contained within is not that useful and leaves you guessing. Also contacting the Japanese Amazon Helpdesk seems futile as they are unable to give any specific information about your situation. For your reference, I have translated the email to English here. Note that even though they put emphasis on your website being the culprit it doesn’t mean that it necessarily is the case. As stated before, I have experience in registering a website that was previously refused with another user. Thank you for applying for the Amazon associates program. We have checked the websites associated with the application for this program, and could not accept your application. If the website of application either violates our terms and conditions or one of the following cases applies, we cannot grant you participation. Either the website is incomplete or newly created and can’t be examined. The website can’t be found due to an incorrect link or you have used a third party website for the application. Access to the entire website or some contents are restricted and therefore cannot be examined. Your name, telephone number, or address in the application form is incorrect. In the website domain you have “amazon”, “javari”, or “kindle” or any other name that is associated with these three. You are also not allowed to use any of these names in your Social Network user names. There is a violation of intellectual property rights. The website includes sexual content. This article is subject to change as I learn more about the situation. My humble wish is, that you leave a comment with your experience so that we can help each other. Thanks for the advice. We have a new Japanese web site for fashion, and have already published a series of posts written by professional writers. But our application to the Amazon JP associates program was still denied. Would you be interested in reviewing our site and submitting the application for approval? Please let me know how I can contact you to discuss in details. Thanks. Hello allan, did you get approve by jp asscociates? I read your article and i really enjoy it. I am a newbie in this area and can you help me please. How to contact directly with you by Line, Gmail, Skype…etc. Feel free to ask any questions in the comments section. I only answer questions in public so that everyone can benefit from the discussion. Thanks for your understanding! I’ve tried various formats, but I still don’t receive any calls from them. I’d like to know if anyone has any idea on the correct format that I need to use? Sorry, I didn’t mean to spam. But I’ve only realized that I copied the wrong message (not the PIN one). The error message that I got is something like Amazon can’t connect etc. I believe it’s the normal phone number including country calling code, without the plus in the front. Did you get it to work? Do I have to log out from my Amazon.co.jp account first because making an affiliates acct? One of the complexities of Amazon’s international Associates Programs is that Amazon JP will only pay commissions internationally with Amazon.co.jp gift cards. This means you can only use them in the Japanese Amazon storefront. I live in Japan and I tried many times to enroll as affiliate of Amazon Japan. I have de US affiliate. And yes, I got the same answer (in kanji) you have translated. Before I had a website to sell smartphone’s recharge, but already quit. I have a news website (nothing to do with sales or products) where i can insert banners to products of a webiste under my affiliate. 1. It is better start a new website? 2. I need a working website selling products? 3. New or working website, affects in the decision? 4. In case of 1. do you have an idea (link of a sample website) of an ideal website? Has anyone had any luck getting approved? I’ve been rejected four times now 🙁 Tried with my own site with 500 articles all unique (rejected 3 times) tried the JP blog method – in the article, rejected 🙁 Tried asking support who just spat out the proforma you’ve been rejected for “any reason” email. Totally at a loss. I would love some tips on what I can do to get approved. Hi! I am new to affiliate marketing and I only have a personal blog (a free one) and I applied and got approved immediately. My blog has been going on for a number of years but with slow traffic, too. I just filled up the form, got the call and typed in my PIN code, and they said, welcome! or they will control anything else? It gives you access to the affiliate system before approval — so wait for it. If you are denied your associates account will stop working. Approval is usually fairly quick though. Good luck! Can I use facebook and twitter for the web? It should be possible but I cannot say how it will affect your changes of getting approved or not. If you try it out — please let us know! Just got rejected after my first attempt despite having an established business and associated website in Japan. One interesting point is that I was given provisionary access to the program and actually put a few associate links up. Then, a few hours later, I got an email saying I had been rejected. Will be applying again after doing a little more groundwork. It really is to their detriment to be so restrictive. Amazon Japan is already a ghost town compared to Amazon US. Would be nice to see them ease up a bit and actually get more business for themselves. Is that not the point of affiliate programs?